I began my career in birth work as an antenatal teacher and quickly gained my reputation as a calm, positive and inspiring voice in the birth world. I decided to move into supporting births and make real, positive differences for how women enter motherhood. Gentle birth leads to gentle mothering and has ripple effects on our whole society. I truly believe peace on earth begins with birth. When I’m not supporting women online and looking after my family I love to be in nature, reading novels and drinking lots of tea with lots of cake! Learning is my favourite pastime and I am always looking to improve my skills and knowledge - what I love about birth is there are always new discoveries and room for improvement to make birth more positive and choices more informed. I am a passionate advocate for information and choice and write a lot about my experience of hospital birth and freebirth, as well as my life as a survivor of domestic abuse. I support all kinds of birth from homebirth to caesarean birth and trust women to make the right choices for them. I pride myself on my honesty and openness and creating a safe space for women to feel heard. I co-run South Wales Birth Circle, South Wales Positive Parenting Group and The Village Slings & Nappy Library. Daisy Foundation Active Antenatal Teacher & Fourth Trimester Educator, I have supported hundreds of women to plan their positive births and find their way as new mums. 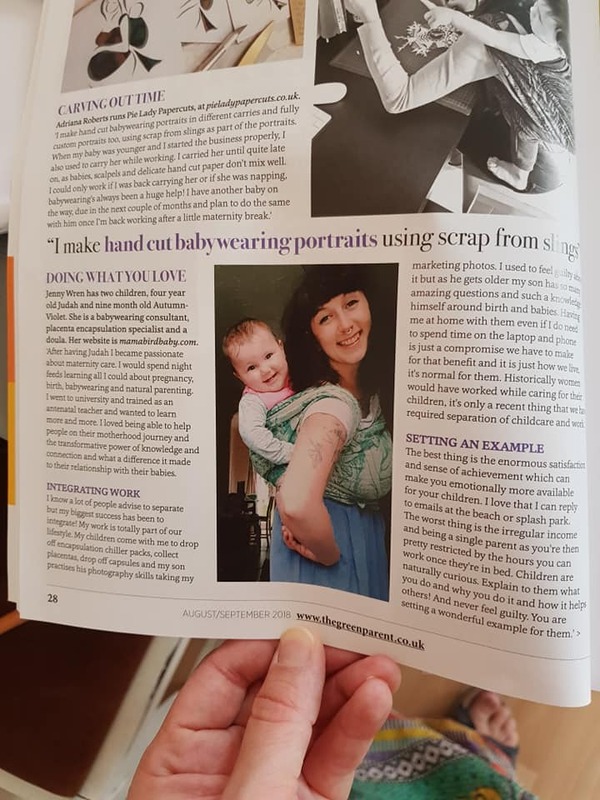 Green Parent feature on women who use babywearing to run their small business!